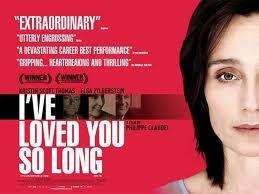 Juliette (Kristin Scott Thomas) is released from prison after 15 years and goes to live with her sister. There, Juliette attempts to cope with the burden of her incarceration and the gravity of her crime. Pale, chain-smoking Scott Thomas delivers a stellar performance (and shows off her fluent French). She inhabits the character of Juliette with warmth and vitality as she throws off the judgement of others and the horrible shackles of her past. Elsa Zylberstein, who plays Juliette’s earnest and caring sister who takes her in, also gives an excellent performance. This isn’t a ‘comfortable’ film to watch, with its themes of regret, grief and alienation, but in the hands of debut Director Philippe Claudel, this is a truly affecting film. It’s also a very French film in its subtlety, philosophy, and pacing. 115 minutes running time.